You are here: Home / Weekly Columns / Opinion / Microsoft Surface Headphones are missing a Companion, the Surface Phone. Microsoft Surface Headphones are missing a Companion, the Surface Phone. 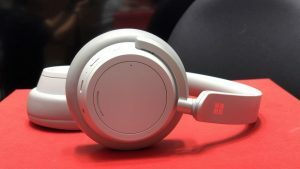 (ThyBlackMan.com) After PCs and Amazon Echo, Cortana has found a new home, the Surface Headphones by Microsoft. Today, the voice assistant is not only limited to Windows PCs but it also available on smart speakers and the newly launched Surface Headphones. Available for purchase from November, the Surface Headphones are worth $349 as they feature robust noise-cancellation, long battery life, and easy pairing. The only thing that’s missing from the whole experience is a companion. The Headphones are an outstanding accessory but where’s the Surface Phone? The wireless Surface Headphones offer what you would expect from premium headphones in the same price range. Not only does it produce great sound, but also they look and feel excellent. The large earcups provide enough sealing to help you disconnect from the crowd. The cushion cover is comfortable on ears and as you turn on the earphone, you can experience 13-level noise-cancellation working to ensure superior sound quality. Microsoft has a world-class laboratory for designing and it can be clearly seen in the hardware products they have delivered so far. It took three years of work to design the Surface Headphones, which clearly means that there’s no compromise with the quality in terms of design and sound. The headband is designed so well that it doesn’t require any extra effort to fit the device on your head. One of the key features of the Surface Headphones is the dial ring which you can turn to adjust volume and the amount of noise cancellation. On the right earcup, there’s a power button which you can use to turn the headphones on and off. The touch controls on the earcups feel smooth and it is easy to answer and end calls using the touch control. You can also play, pause and skip tracks using the touch panel which is located on the earcups. It is also worth mentioning that the Surface Headphones are smart enough. When you take the headphones off, the music stops playing and when you put them on, the music resumes playing. The wireless headphones can be paired with your devices using a Bluetooth connection and the best thing is, you can connect them with any Bluetooth-enabled device which means Android, iOS, Windows, and Mac, all the platforms are supported well. Now when iPods are no longer around, smartphones have become the primary device for music. Unless you are watching videos or movies on your laptop, your smartphone is probably your first choice for music. With Swift Pair, Microsoft has given us a more convenient way to pair Bluetooth headphones. So when the Surface Headphones are available, it’s time for Microsoft to launch a new companion for this smart accessory, the Surface Phone. In the last few months, you’ve probably heard or read about the Surface Phone, a foldable smartphone Microsoft is secretly working on. The father of Surface brand Panos Panay has already teased that the company is actively developing a smartphone. A recent patent published for the Surface Phone reveals that Microsoft is working on a single screen device that features a hinge. An interesting thing about the design is that the hinge works independently so you can fold the screen inwards and outwards. One more interesting fact about the display is that there won’t be any line when the screen is opened. It means only a single screen will be there so you can easily use Surface Pen on the screen and the user experience won’t be ruined. We still don’t know when will Microsoft announce the Surface Phone, but we hope that it will happen soon. The Surface family is growing and now when we have many new products including the Surface Laptop 2, Surface Pro 6, Surface Hub 2, and Surface Headphones, the only thing that’s missing is the Surface Phone. We hope that Microsoft will make it happen anytime soon. According to leaks and rumors, it can happen in 2019.